Congratulations to "Brenda M.", the winner in Susanne's giveaway. Thank you to all who participated! Good morning. 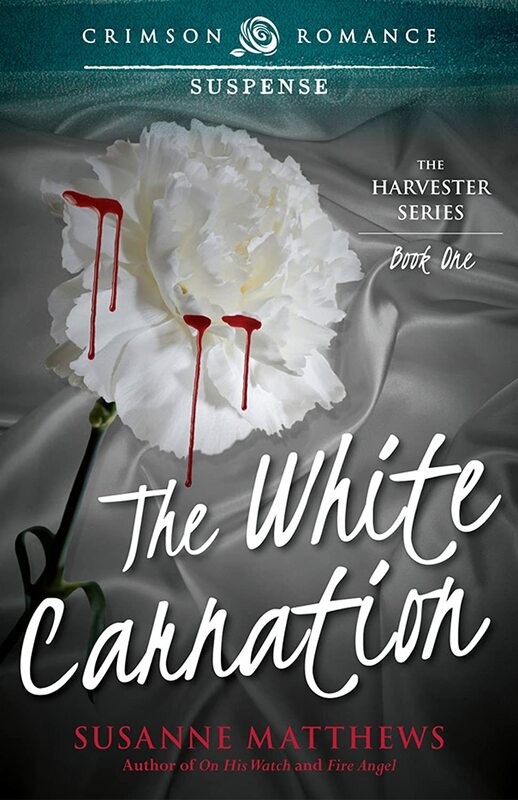 Thank you for having me as a guest once more and allowing me to share my new release, The White Carnation, with you. Most romance writers focus the majority of their efforts on creating the perfect hero and heroine, the characters the reader will love, support, suffer with, and ultimately rejoice with when the happily ever after arrives. Like most authors, I strive to make my characters memorable, but not only my main characters. I give a lot of thought to the secondary characters in my stories as well. In suspense romance, the hero and heroine have to fall in love and overcome inner struggles, but they also have to face and defeat the villain—a person, an animal, a supernatural threat, Mother Nature—the choice varies with the situation. In Fire Angel, my characters fought a crazed arsonist; in In Plain Sight, it was an Irish Mobster with a vendetta; in On His Watch, it was a killer for hire and his employer; and in Echoes of the Past, it was a meth lab owner and the possibility of hypothermia. Each situation is different, but I had to give a lot of time and thought to developing the villain, planting the necessary clues for the reader, and of course complicating the situation with lots of twists and turns. Fire Angel is a lot like Motive—you can probably figure out who the arsonist is fairly early in the story, but understanding why he does what he does and why he’s considered a suspect and then dismissed, is what keeps you reading. I made it a little harder to identify the actual killer until later in the book in In Plain Sight, On His Watch, and Echoes of the Past, but in reality, if the reader gets into the story, there has to be someplace where he or she suspects who the culprit is, and most importantly, the reader has to be on board with whatever ultimately happens to that person or persons as the case may be. If I suspend reality too much, it’ll ruin the story for them. In the Harvester Series, things are more complex because while the books are a series, the romance in each one must come to a satisfactory conclusion by the end of that particular book. The main characters from one book become secondary characters in the next, since their lives are still tied to the Harvester, but their roles change has the POV moves to the new hero and heroine. There’s more than one boogieman in this trilogy. While the Harvester is the center of attention and evil in all three books, he’s by no means on his own. In Book One, The White Carnation, I needed to create a sympathetic character who would morph into a monster. I needed to situate that character in an environment where his actions would seem logical and acceptable, but absolutely insane and appalling to others. And of course, I had to lay the groundwork for the next book in the series and the ultimate villain, the character I introduce in Book one, flesh out in Book two, and bring into his own in Book three. I’ll leave it up to my readers to decide if I’ve met the challenge. Comment on this post for your chance to win an e-copy of one of my previously released romantic suspense novels mentioned in this post. Let me know which one you’d like to win! Every hair on Faye’s body stood on end as she approached the oak door. It was open. Mrs. Green never left the door open. The woman double- and triple-locked everything. The last time she’d been here—was it really two years ago?—it had taken forever for the woman to undo the locks and let her in. “Mrs. Green, are you there? It’s Faye.” She pushed open the door and the unmistakable scent of blood—that slightly sour, coppery scent she’d never forget—greeted her. She swallowed a scream. The place was a disaster: furniture overturned, papers, books, CDs, and DVDs littering the floor. There, amidst the chaos, lay Mary’s mother, the jagged red line along her throat testifying to her death. Faye dropped the flower and damaged purse, some of the contents spilling out and landing in the pool of blood—a tube of lipstick, a pack of gum, a roll of breath mints—strange sprinkles on the deep red surface. The pristine white petals of the carnation soaked up the redness, adding to the eeriness. She ran to the powder room and threw herself on her knees barely in time to spew what was left of her cucumber and watercress sandwiches into the toilet. The pungent, sour aroma of vomit filled the room. Tears tracked down her cheeks. The gut wrenching heaves that followed brought up bile and left her exhausted. She sat back on her heels, trying to control her anguish. With a shaking hand, she pulled her cell phone out of her jacket pocket and dialed a familiar number. “Homicide, Rob Halliday.” The voice was tired, bored, resigned. “Where are you?” Rob was all business, as if there were no painful history between them. Deep down, she knew this no-nonsense, professional side of him was what she needed, why she’d called him and not 9-1-1. I would love to win Fire Angel! Thanks for the chance. Thanks for having me, Maureen. It's always a pleasure to stop here. Your stories sound like they have so many tantalising layers. I love that. ON HIS WATCH would be great thank you. Fire Angel would be my choice! Congrats on your new release! Thanks for sharing your post with us today Susanne!